QUICKIES ARE JUST THAT! QUICK! Our first Quickie is history and hopefully I learned some things from the experience as well. We did Raymond Crawford's USA Star. I am super pleased with how it turned out. My problem is me. Yep - me! In my haste to share with the participants I did a couple things wrong. First I included the incorrect sized beads. The stitch guide referred to the correct size but I grabbed the wrong ones. So, that necessitated a second mailing - my cost of course - and the beads were not needed until the second session so no harm. Then, I decided that I needed a little more glitz so I added another Silk Lame` that was not in the original mailing. So another mailing - my cost of course - again. Then I learned that I accidentally sent the draft Session 2 instead of the correct one. So that was corrected. This just wasn't my week on this one. So hopefully everyone is having smooth sailing on their end for this guy. It was definitely worth all the headaches I caused myself! You may still get this complete kit, you will just need to wait until the canvases get in. JUST WAIT UNTIL YOU SEE QUICKIE NO. 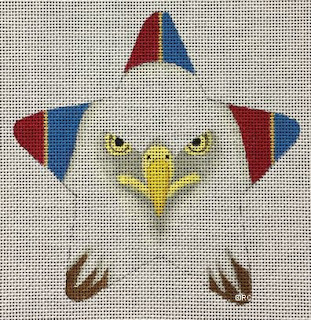 2 - THE EAGLE STAR! Okay, I just had to share. He was too cool to keep under wraps. These guys are way too much fun - and quick! QUICK! - get it? I know it does not take much to entertain me. 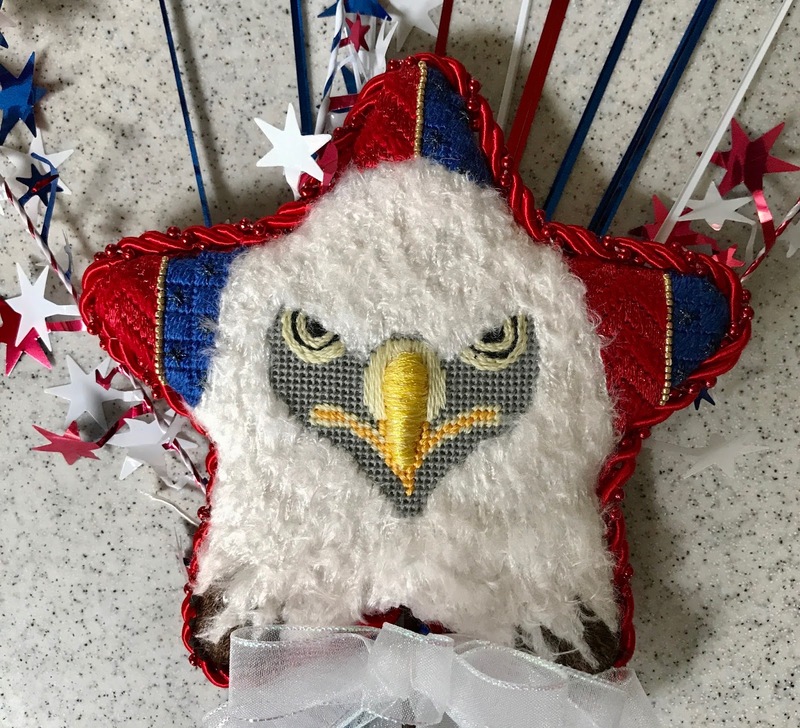 If you want to join us for the QUICKIE Eagle Star from Raymond Crawford Designs, just email me at duodesignsinc@yahoo.com. Registration is going on now for this upcoming class. 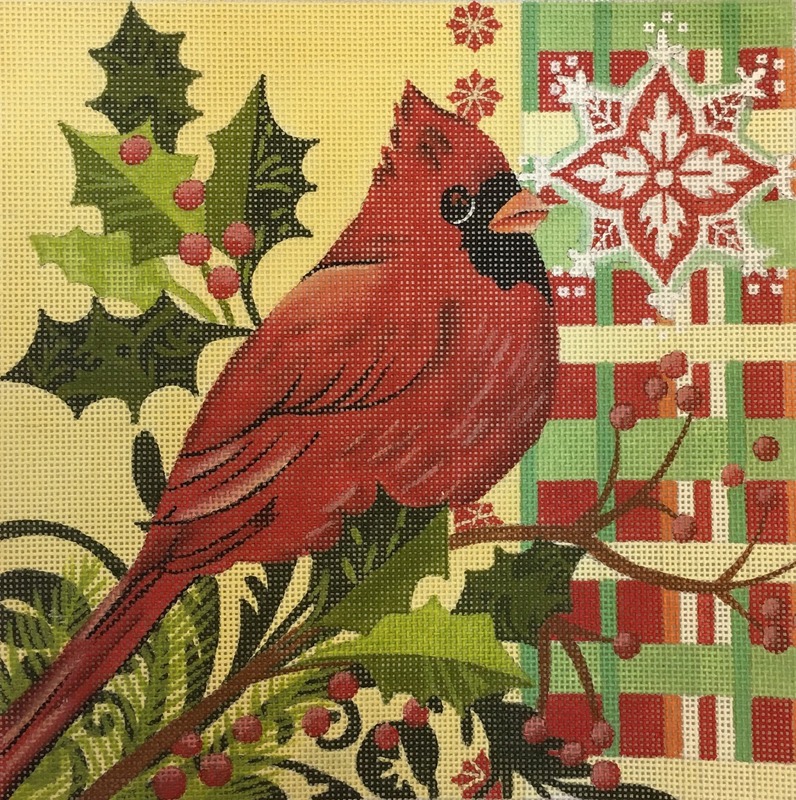 The all-inclusive class - hand-painted canvas, threads and embellishments, two lesson packet sent via pdf and shipping/handling is $125. Classes will be starting sometime in July. And whatever do we have in line after this fantastic guy? Well, Uncle Sam of course! 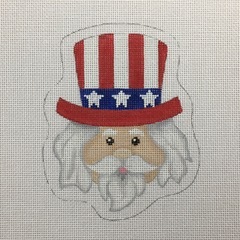 Uncle Sam is an exclusive design from Pepperberry for our use in the QUICKIE SERIES. He is approximately 4.25 x 5.25" in design area on 18ct. mono canvas. Can't wait for him to join our other two patriotic ornaments. Again, if you would like to be on the notification list just send email to duodesignsinc@yahoo.com and we'll keep you informed as specifics develop. And . . . there are others on the horizon. 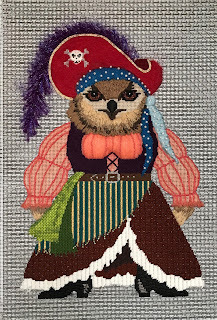 I have been busy finishing Captain Blackbeak's Wench canvas from JP Needlepoint. This fun piece is being sent off for consideration as a class in an upcoming retreat. Fingers crossed! 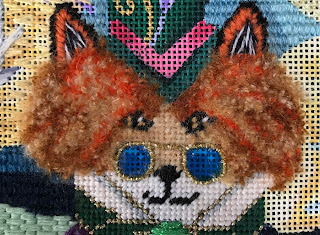 She is jam packed with fun techniques and threads! She is at the finishers so that she can be completed just like her 'fellow' . Won't they be a lovely pair? As stated last week, lessons are being posted as scheduled for the various classes that are in progress. Creeping up quickly are some of the other exciting pieces! If you are taking any of these classes be sure to get your canvas on order early. We are available for assistance for those who do not have a local needlepoint shop. 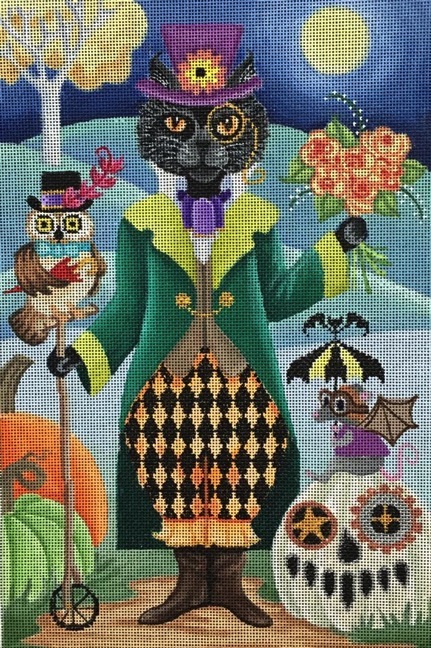 First lesson for Steampunk Cat is August 15. Invoicing will be July 1st. 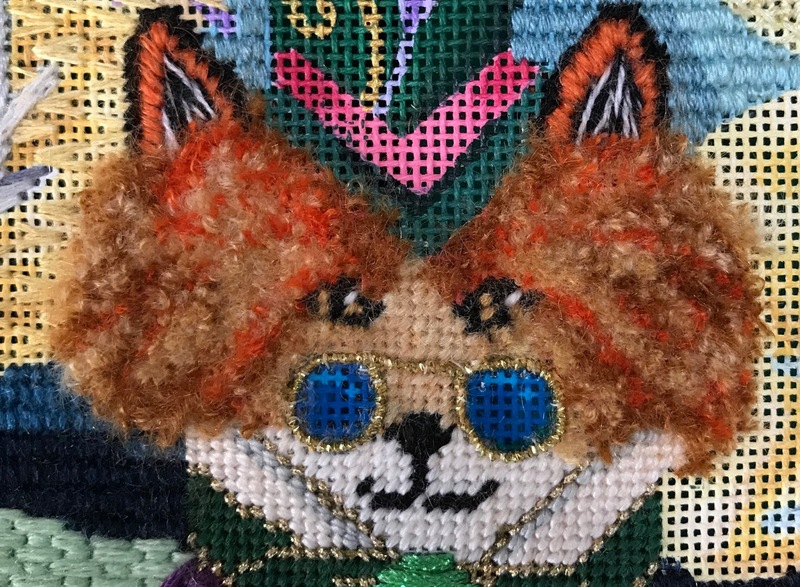 OMG the number of threads and embellishments this guy required from my perspective. I think it is well over 50+ items. Right behind him will be the fun Santa Ornament Wreath from Raymond Crawford Designs. 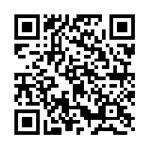 The first lesson is scheduled for September 15. Invoicing will be August 1st. 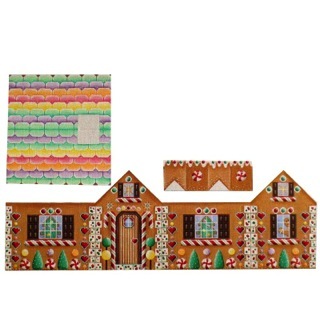 November will bring on our first lesson for the Gingerbread House from Rebecca Wood. Some had this lesson forwarded to them early so they could do some of the tedious background work. Invoicing will be mailed October 1. I love this picture! It is so deceptively small in appearance - LOL. This guy is 33" long and 14" high. And sprinkled in between will be the Arctic Parade sessions, Nutty Professor Hooter and the Quickie Series. Scroll down to last week's post for a reminder of upcoming Retreats too. Email me with questions about any of the upcoming classes at duodesignsinc@yahoo.com. We would love to have you join us! So, as you can see we don't have to worry about boredom at Arthur Acres. Have a great weekend! It has been pouring the rain here! Yes, this was the week to post the next sessions for the ONLINE MYSTERY CLASSES! This month we say goodbye to the Large Easter Rabbit from Brenda Stofft. Yep, lesson 6 is already here! We were able to play with lots of interesting threads and wonderful techniques on this guy! 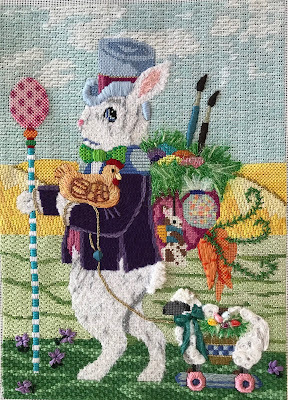 He was fun and now he must head off to the finisher so he will be ready for Easter 2018. Session 5 was up next for Mr. Steampunk Fox also by Brenda Stofft. We gave him his flower in his pocket and most excitedly was working on his face. His walking stick was also completed. And what about those glasses! Too cool! Ahhh. The Menorah from Tapestry Fair has Session 4 revealed. These two candles offered a glimpse of or nue`, some Jessicas, and, of course, some gem attachment and beading. Songbirds from Danji is the new kid on the block. We shared Lesson 2 for these beauties and completed our first two birds. Some beading involved and some personal decisions had to be made. NEW CLASS! Yes indeed! Next month we will be introducing the first lesson for the Cupcakes design by BB Needlepoint Designs. I am seriously trying to not go overboard on this one! But oh my goodness. There is so much opportunity to try all kinds of funky threads and techniques. Sundance even made a special mixture of beads for us! All invoices have been mailed (email me at duodesignsinc@yahoo.com) and everyone enrolled should have received theirs. All the kits have been mailed except for a few late comers. There is still time to join this fantastic group so come onboard! The 6-Lesson packet is $150 and one lesson posted each month. Check with your LNS to see if they have a canvas. If you need assistance just email us and we will help get you in the group to play with us. 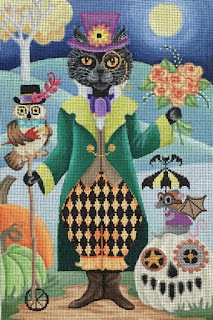 Next up is Steampunk Cat. This guy may be our next class that will have a lesson every other month instead of monthly. If you are not on the list and wish to be just email me at duodesignsinc@yahoo.com. The first lesson for this guy is scheduled for mid-August. Invoices for the 6-lesson packet will be mailed around the first of July. Get those canvases ordered so you won't be left behind. The beautiful American Eagle Star from Raymond Crawford is on stretcher bars and on his way to be ready to fly to you. These QUICKIE classes are designed to be able to work up fairly 'quickly' and provide a take-along type project. 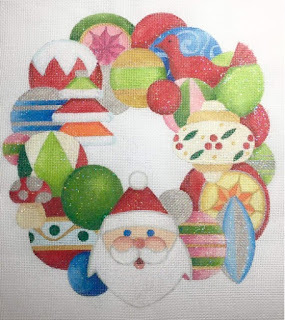 They can be finished quickly and you have a completed canvas in no time. 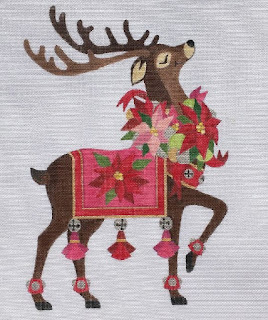 To join the list for the all-inclusive class - handpainted canvas, threads and 2-lesson instructions in pdf format - simply email me at duodesignsinc@yahoo.com. Total cost is $125 including s/h. The early part of 2018 I have several retreats that I will be teaching. Three I can share with you now. I am humbled to be invited to teach once again at the NeedleNook of LaJolla Retreat in LaJolla, CA. There are always great teachers and fantastic students! Project galore! Such diversity! This combination creates a lovely memory for all who participate. Details will follow soon when open registration is announced. Be sure to follow their website so as not to miss the announcement. 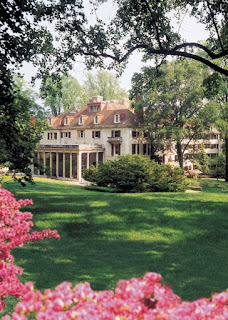 Another is the retreat held at Winterthur Museum in Delaware in - March 23-25, 2018. Go check it out - I believe there is still time for an early registration discount. Sooo, lots to absorb and ponder until next time . . . I am just having the best time in my 'senior' years! 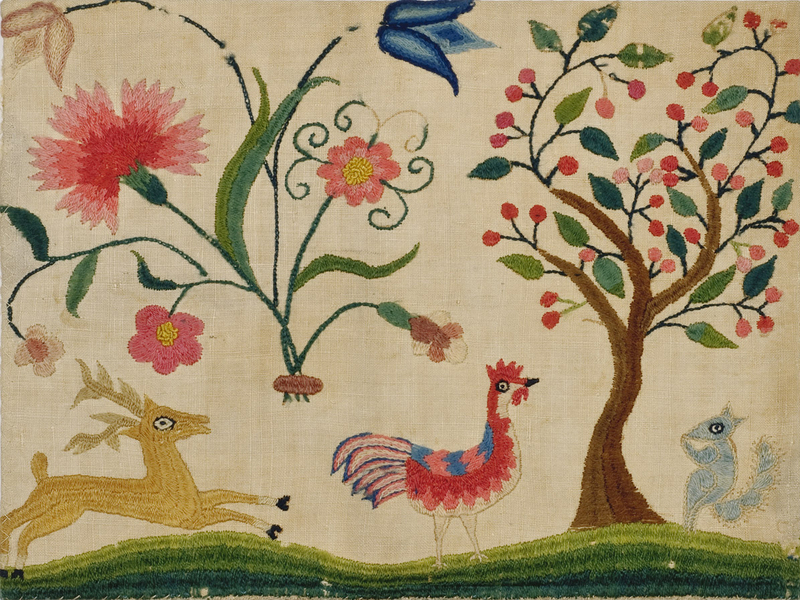 I am surrounded by all this beautiful needlework and I get to select what I want to work on. As you may have noticed, I mostly work on things that are fun and that are receptive to some funky threads and different techniques. That's just me. Invoices for the upcoming CUPCAKES have been mailed. Those who ordered kits through my contacts have been contacted by private email and advised when to expect them in the mail. SUCH FUN! Remember if you are ordering your canvas from your LNS (as you should) be sure to state that it is the canvas for Sandy's class. This one is slightly larger than the first one released. The first lesson has gone out for the first canvas of the new QUICKIE SERIES - USA Star by Raymond Crawford. The second lesson will be released in the upcoming week. This kit caused a few bumps for me (not my students) as I added a thread at the last minute so had to do a separate mailing, and I discovered that I picked up the wrong sized beads which involves a second mailing on my part. The beads aren't used until the second lesson so no harm on that one. Just working out the kinks. 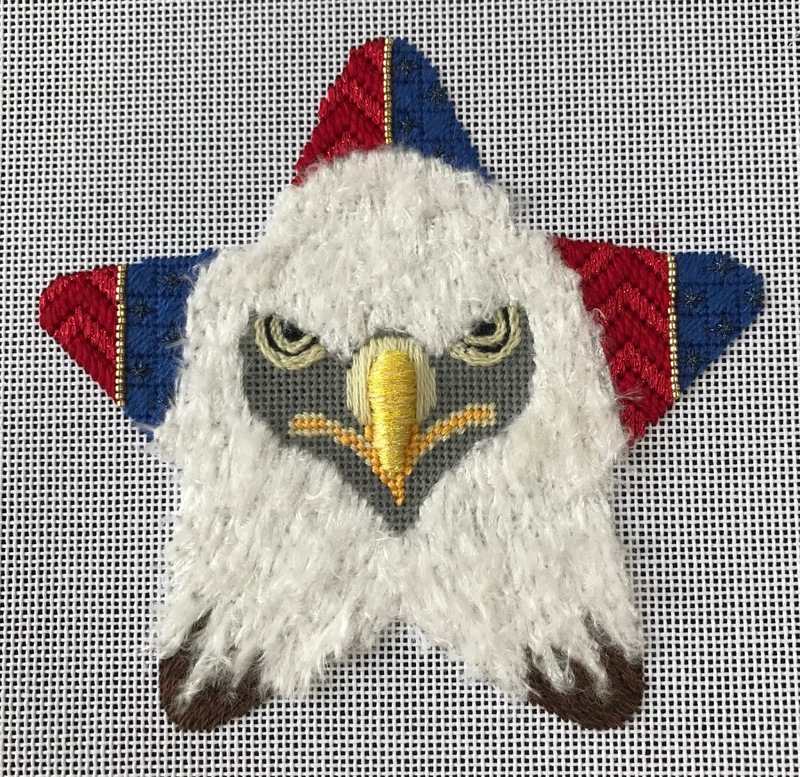 Now on to prepare for the Second QUICKIE SERIES - EAGLE Star by Raymond Crawford. Working on this guy now. As I have stated many times, I am a flag waver and for some reason I tear up when I work on him. Don't know if he reminds me of my Dad (Daddy) or what but he really gets to me. He is the most serious piece in the series. If you want to join in this quick turnaround class just email me at duodesignsinc@yahoo.com. The all-inclusive class is $125 and is invoiced through PayPal. Next up will the Uncle Sam Exclusive from Pepperberry Designs. And wait until you see what is in the wings. Another exclusive is being hand painted as we speak. 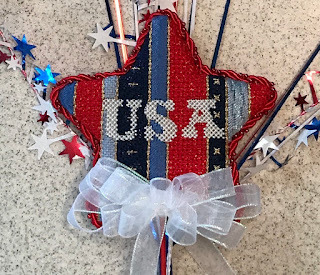 I have a couple more ready in the red-white-blue patriotic type theme still to go. Now we need another theme to add to our fun. Let me know if you have something in mind that you'd like to make a bouquet of finished pieces. The early part of 2018 I have several retreats that I will be teaching. Two I can share with you now. One is the retreat held at Winterthur Museum in Delaware in - March 23-25, 2018. Okay, I think that's all I can share this week. Stay tuned . . . . always something going on! Beautiful day in Kentucky! We have been able to sit out in the swing and enjoy the birds and watch the hummers (in between stitches of course). 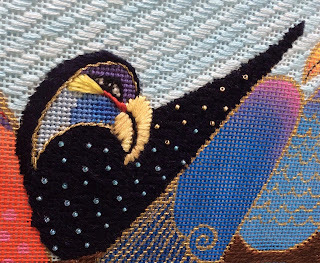 People say to me all the time, I don't know how you do, how do you get so much stitching done? Well, it is simple. All I do now is stitch! I am fortunate to have a hubby that does the cooking - major blessing - and the only disruptions are to get up and throw a load of clothes in the washer or dryer every now and then - and he helps with that too if he remembers. I never work on just one project. 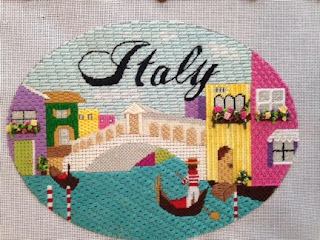 Right now I have on the frame a piece I'm stitching to propose to Blue Bonnet Studios for the 2019 Retreat - after I just removed the ornaments I created for the riverboat stitching cruise - Party on the Po. All the while I am also rotating and adding stitches for the future lessons of the Online Mystery Classes. Sitting next to me on the sofa is the beautiful Winter Cardinal that I will be teaching at Needlepoint in New England Retreat in April 2018 and I ponder it while I am filling an area with upright cross stitches on another piece. 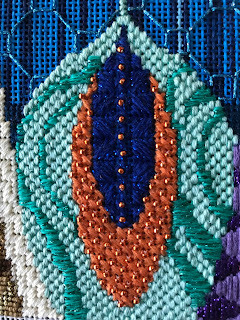 I do not remember ever stitching a piece from start to finish - just that piece. I always manage to jump around from one to the other. But the magic is that the majority of them do get finished. All my Online Mystery Classes get completed but I also finish models of classes that I teach face-to-face. This works for me. It would drive some people crazy. But what I have created for me is a means of stitching continually and never getting bored. If I am working on a piece, like the one for Blue Bonnet, and I suddenly have a brain storm come to me for a QUICKIE class project, I scoot the BBS piece aside and stitch the area on the other that inspired me. I then return to my other piece. So, for me, all the choices surrounding me prevent my every getting bored and that makes me happy. 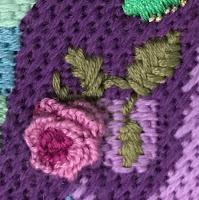 I rarely get myself in a corner, but when I do have a dangerously encroaching deadline somehow the bits of stitching I did while working on another piece are very helpful in that I can concentrate on finishing the piece rather than starting from scratch. I hope I am explaining this okay. 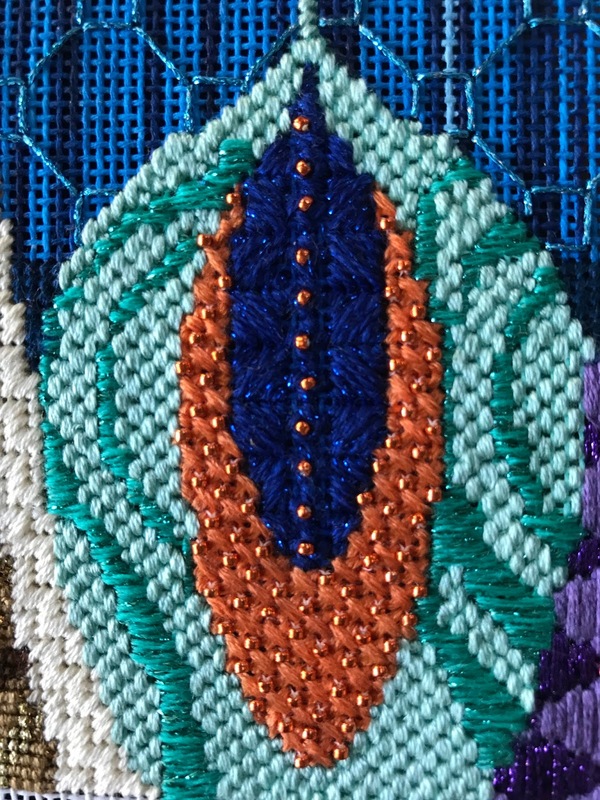 Anyway, the answer to may sanity (if I may presume that I am sane) is that I always have a choice of something else to work on if I am not happy with how something is turning out at the moment on my current design on the frame. 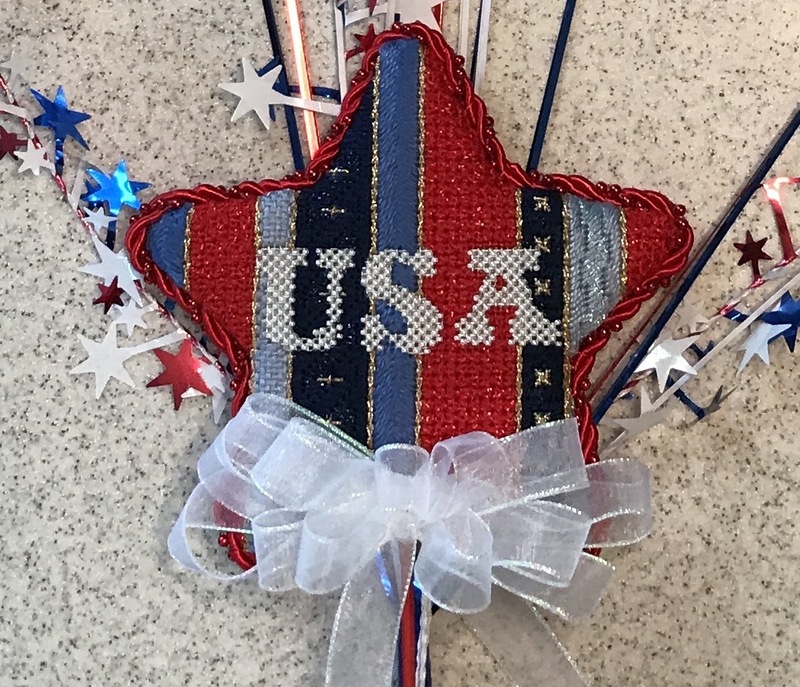 NOTICE: Kits and the first lesson have been mailed for the QUICKIE - USA Star - we have two extra kits if interested - $100 - first come-first served. 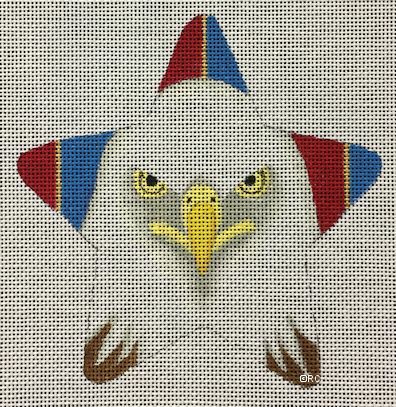 Registration is now open for the next QUICKIE - Eagle Star from Raymond Crawford Designs. The all inclusive class includes a hand painted canvas, threads, 2 classes posted in pdf format and shipping and handling. This kit is $125. Email us at duodesignsinc@yahoo.com if you want to join the group. There is a limited number of class kits so it is first-come, first-served. 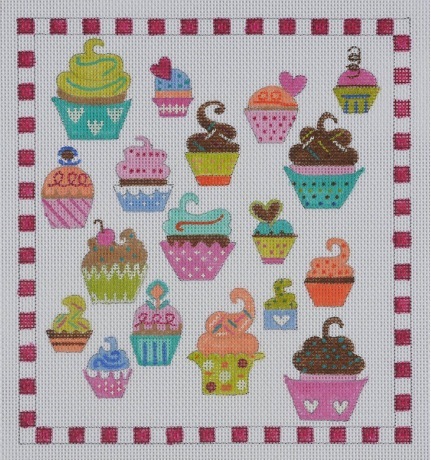 In less than two weeks we will introduce our next new class the fun and funky CUPCAKES. This is chocked full of fun stitches and lots of interesting threads. 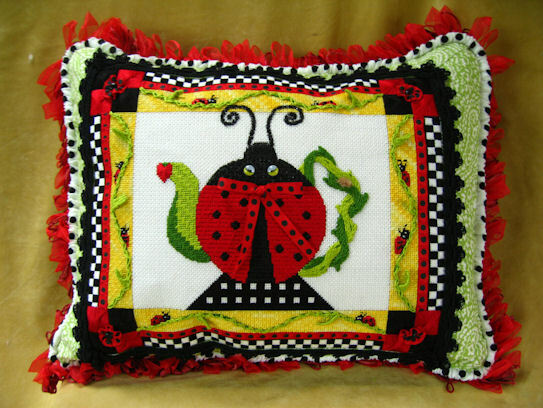 This delightful design is from BB Needlepoint Designs. Look at all the trouble we are going to get into. 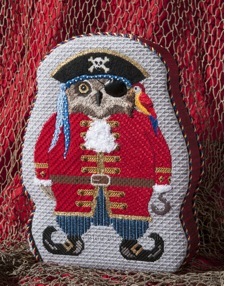 We are introducing you to lots of unusual threads that many of you have never used before. Things like Legacy, silk ribbon, Memory thread, 1/8" metallic ribbon, boucle even some beads and buttons. How about rushing, couching, weaving, and who knows what else? Needless to say, I am thoroughly enjoying this piece because we can try all sorts of techniques and the spaces are small enough that you get the opportunity to try something but it does not dictate the entire piece - so if you don't like a technique we can do something else but at least you have been introduced to that particular technique. We will be saying goodbye to our wonderful Large Easter Rabbit this month. Be sure to watch for the posting of the complete piece. Aren't they cute? And quick to work up too! We have so much fun lined up that it is getting more and more difficult to be patient. Did somebody say 'Goody Bag?" 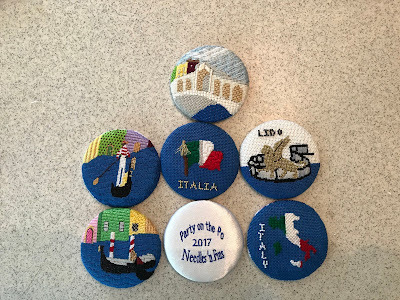 I am told that classes are filling for the Needlepoint in New England Retreat in CT April 2018. I am teaching the wonderful exclusive from Maggie that I call Winter Cardinal. So fun. I believe there are a couple spots left but don't know for how long. 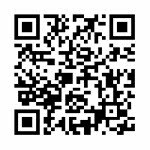 Go have a look! This is a new venue for me so I don't have a lot of information that I can add right now except to provide you with links for registering, getting more information, reviewing the various classes offered, etc. 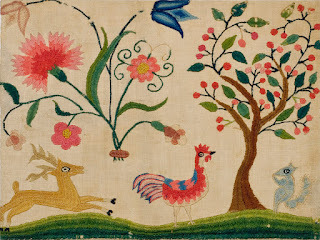 The thing that attracted me to this event is the fact that any participant may bring a child between 10-18 years old to learn to needlepoint; they will be provided a canvas to work on and learn basic stitches and they get to come FREE! I am always in favor of supporting anyone who is trying to get our young people more involved in our art. People are currently signing up now and if you pay in full you receive a 10% discount. Okay, must get back to it! Have a great weekend!